The biggest brands in technology get the typographic treatment. Graphic designer Vinicius Araújo has brought together his two loves of technology and typography in his latest project 36days Electronics, transforming the biggest gadget brands into Helvetica-styled letters. The project, which Araújo started posting on his Behance page on 13 October, has given the Brazil-based designer a chance to really push his industrial design and motion graphics skills to the limit, all while having a bit of fun. And thanks to using the alphabet as the basis, there's been a structure in place to help him along. Updates are still being published, but enough time has passed for us to now enjoy the whole alphabet with a technological Helvetica twist. The 26 letters in the series capture the essence of famous technology brands by incorporating textures, logos and even buttons associated names including Motorola, Intel and Kodak. 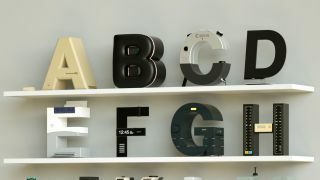 Kicking off the series is a letter A decked out with the look and feel of an old Apple Mac. There's even a mouse plugged into the side of the letter to finish off the effect. Explore a selection of our favourite Helvetica-inspired, technology powered letters from the 36days Electronics project by scrolling through the gallery below – just click the left or right arrows to see them all. And remember, you can see all 26 on Araújo's Behance project page. Who else but Xerox deserves to be immortalised in the letter X? The mathematically minded among you are probably wondering why the project is called 36days Electronics when the alphabet is a whole 10 letters short of the title. Well, that's because Araújo isn't content with just turning the alphabet into hardware. He's also turning numbers into gadgets and gizmos, too. Currently the project is up to number 5 and has seen 3D digits become vending machines and coffee machines. Be sure to keep an eye on the project and catch how all the numbers turn out.